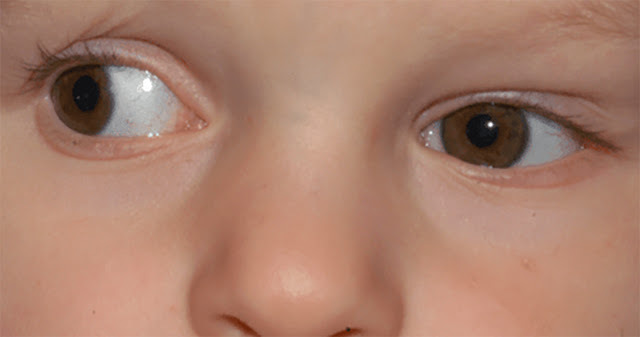 Duane syndrome (DS) is an eye movement disorder that is present at birth and characterized by a limited ability to move an eye inward towards the nose, outward towards the ear or in both directions. The frequency of DS in the general population of individuals with eye movement disorders is approximately 1-5%. About 40% of patients develop esotropia, a head turn toward the eye to maintain single binocular vision, or they maintain a straight head but accept esotropia, and suppression, if available. My son was born with DS and diagnosed around 18 months of age. I had noticed a slight “lazy” eye and discussed it with our pediatrician. The recommendation was to watch it until he was a year old. As the year progressed the eye became worse and we were referred to a pediatric ophthalmologist. During the initial visit eye exercises, dilation and a vision screening were completed. The signs and symptoms the ophthalmologist discussed were: the upshoot or downshoot of the eye, a head tilt or turn and eye misalignment. As early as three months old, my son had a head tilt that seemed flirtatious in nature and then linked to his reoccurring ear infections. As I understand the diagnosis, the head tilt is a natural solution to correct the double vision an individual sees, or to align the eyes. Photographs were the best tool in reviewing his symptoms; there were not many where he was looking straight at the camera, more common are pictures where his head is tilted to the right. The head tilt is so that he can see what is in front of him. More noticeable is his head turn where it appears he is trying to look behind him but actually looking to the right. Developmentally he is right on target and has not appeared to be hindered in any way. My son is all boy and very adventurous. Climbing and running seems to come as natural as sitting up. He frequently trips or falls in very familiar spaces, sometimes over his own feet. My guess is that this is both developmentally normal and attributed to Duane Syndrome. There are times when he has trouble with depth perception, for example when food is located in a certain location to the right he appears not to see it, in reality he seeing double. Instinctively he eliminates the area by not acknowledging that there is food available. He is now almost 20 months and will be having surgery to help alleviate the head tilt/turn. The surgery will take the existing muscle and split it into two muscles. This will not “cure” DS but reduce the side affects and improve alignment. The most frustrating part of DS is trying to make sense of all the information. As a person who has never experienced DS, or double vision, it is hard to imagine what your child is experiencing. The most helpful resources have been internet groups where other families share their experiences and resources.